Whitley Bay are back on cup duty this weekend when they welcome Heaton Stannington to Hillheads in the Emirates FA Cup Preliminary Round. Like Whitley’s previous round opponents Ryhope CW, Second Division Heaton are playing in the competition for the first time in almost 40 years and in the last round they overcame First Division opponents Norton & Stockton so they will come into the game hopeful of causing another upset. Although they are close geographically, games between the two sides have been rare. On that occasion, Whitley were 4-0 victors, with the legendary Billy Wright scoring all four goals. 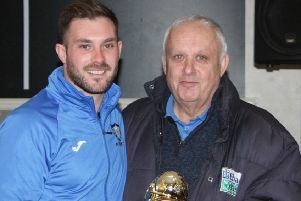 Whitley’s recent form has been very encouraging and they have just strengthened their squad with the addition of central defender Phil Lumsden, was formerly at Newcastle Benfield and Team Northumbria. With ‘The Stan’ expected to bring good support to Hillheads, a big crowd is anticipated for this local derby, with kick off at 3pm. Should the game end in a draw, the replay would take place on Wednesday, September 2 at Heaton’s Grounsell Park, kick off 7.30pm.